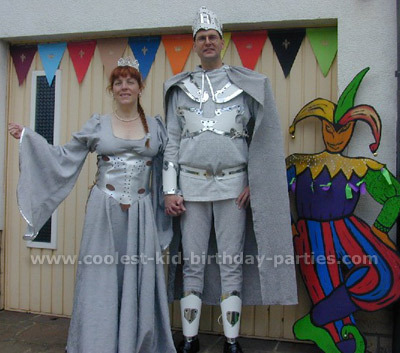 “Ritter Fest” or a medieval knight party was for my daughter Violette. And my son liked it so much he had the same theme the following year for his. They both say the medieval party was their favorite. 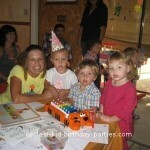 Birthday parties for me are a BIG thing! In hindsight, I know this comes from growing up in a large poor family and the fact that my sister’s birthday is the day before mine. So, we always celebrated it on her day and I got the leftover cake re-frosted for mine the following day. Fortunately, I married well and can afford to spoil my kids and the truth is that these parties are really for me too and my husband indulges me. Therefore, I know they will be classed as over-the-top and too expensive, but I love them all the same and as I don’t have any other vices, I don’t feel too bad about it. I start very early in deciding the theme and planning the party. 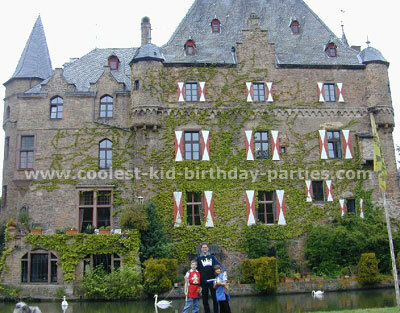 Living in Luxembourg intrigued my romantic nature, and the medieval castles were the imagination for this party. We would hold a real “Medieval Feast” with all the trimmings. It does help that I am pretty artistic and do all my own sewing (leftover from the poor days when my clothes were homemade, but now makes the party even better). “Once upon a birthday, there was a noble child named Lady Violette Janauan Vereecken who became a fanciful five year old. A knightly celebration was declared on Saturday July 20 for the entire enchanted kingdom making merry from 14.00 to 18.00″. The Town Crier and the Jester (my husband and my son) delivered the invitations exactly 2 weeks before to the doors personally (all in true costume of course). 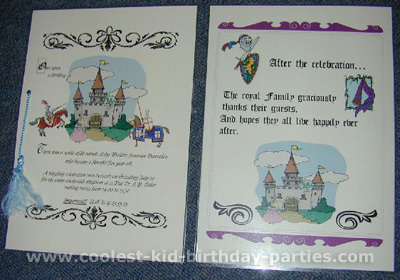 The invitations were printed and laminated and tied with blue silk ribbon tassels. 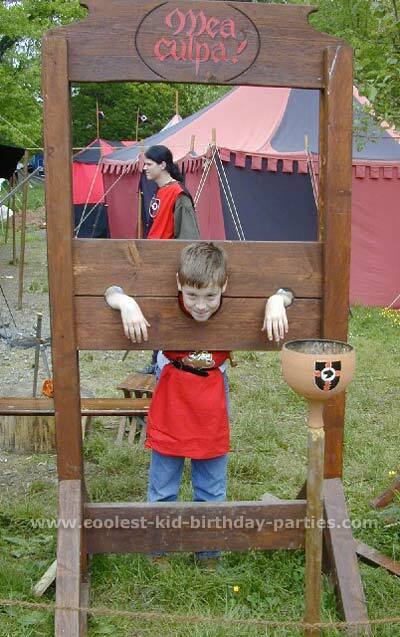 In the meantime, we had prepared many things as to the medieval decor. Life size wooden cut outs of a jester, throne, and a knight were painted and hung. All window and doorframes were hung with pointed garland stenciled with shiny golden paint of a “fleur-de-lys” and kings crown. The fencing was covered with linen and painted completely with a 3-meter (12 foot) fire-breathing dragon. We had over 60 foil balloons tied everywhere and the dragon pinata hung from the tree. 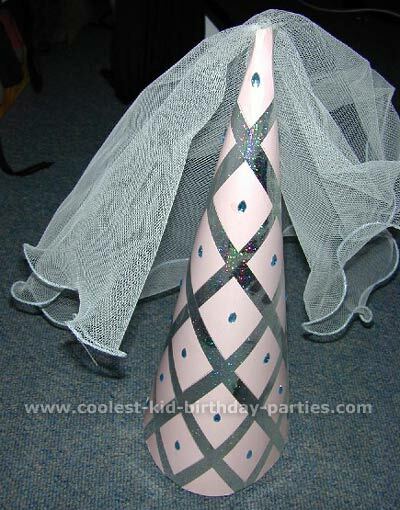 A round jousting tent was set in the garden, a throne chair and hung dias (mosquito bed netting) draped from the balcony with the treasure chest and trophy table next to it. A large bouncy castle in castle shape was in the garden. All of this is in the video, and I hope to get still pictures from that for you, but wanted to get this sent to you in time and have only the still camera pictures in this email. I am a seamstress by trade, so every person that was a helper was given a tunic to wear. 2 men who organized the games, and the magician, and the cook, wore black tunics appliquéd with silver crowns, the 2 women wore yellow tunics appliquéd with gold crowns and colored jewels. 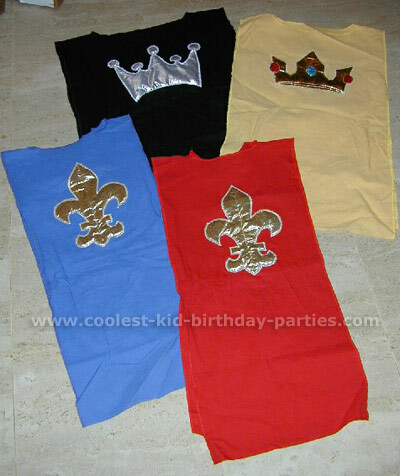 All the children wore either the blue or red tunics appliquéd with gold fleur-de-lys. 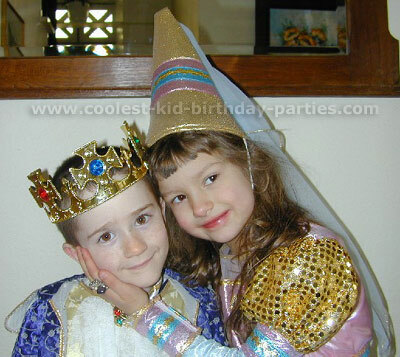 My son was the jester; my husband and I dressed as King and Queen. This was taken in the morning before the decor was finished, but it is the only one where we are together. So it is all I have, but you can see the painted jester and the garland very well in it. 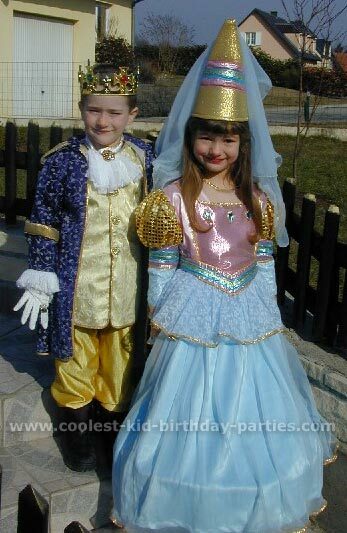 My daughter and her “boyfriend” were the princess and prince. I made all the medieval costumes. 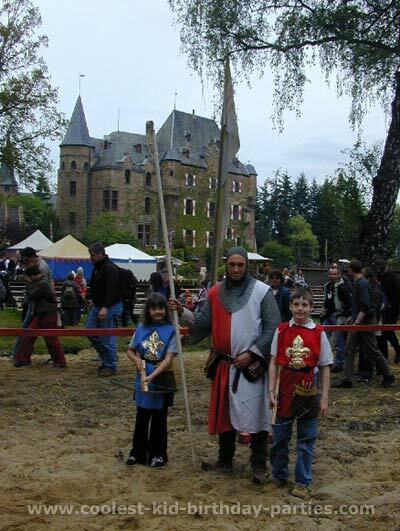 This picture shows some kids at my son’s Medieval Knight Ritter fest (a year later, but essentially a repeat!) but it is the only bit of bouncy castle in the still pictures. I printed a program for the helpers and the day looked like this: 2.00 pm Children arrive and chose from a bag of marbles that were either blue or red. Red team got the red knight tunics and blue the other. 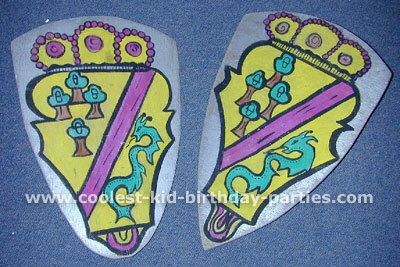 Boys got medieval knight shields (made of wood). They also got blow up medieval knight swords as props (they took them home as gifts plus other things later). 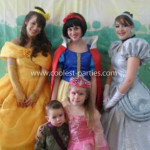 Girls had already been asked to come dressed as princesses and they were given medieval pointed headdresses, which were about 16 inches tall and were decorated with blue rhinestones and silver glitter foil sticky paper. Then I made the netting and edged the borders in blue thread and inserted fishing line to get the wavy look. They also got blow up princess wands (which they also took home). 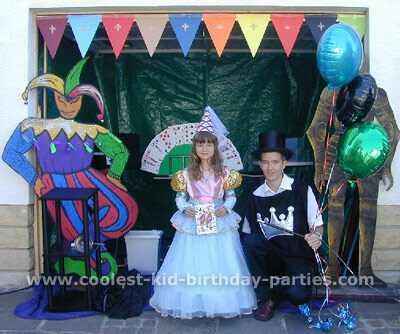 After all the kids were dressed in medieval attire, they went to the photograph area and had a Polaroid picture taken with the Princess and the jester, amid the life size medieval knight cut outs and decor and then to the tent table to make the frame. I had already cut and stenciled the fleur-de-lys and the medieval knight crown embossed with gold paint. This was heavy card paper A3 size and folded in half so the picture could be glued inside and then pasted front on for a A4 size stand up. I provided glue, beads, glass rhinestones, glitter, stickers, paint pens pearls, etc. for them to embellish with. They took them home too. The above picture is an alternate photo opportunity for boys. After they finished this they jumped in the medieval knight bouncy castle until all had finished. 2.30 pm: Speech and welcome by the king. The king gave an explanation of the medieval knight games and teams for the medieval knight competitions. Large board at the throne hung and names added to either blue or red side. Knights chose their princess partner! After each medieval knight game the winner was declared and a blue or red token hung on the poster (so you could see at all times who was winning). 2.45 pm: Pass the Crown Game. This is similar to pass the parcel; as each child would lose when the music stopped, the king would give them a chocolate coin and they moved on to the “put the crown on the princess”. This gave them a chance to all participate all the time and not be bored. Also, the blindfolding takes a long time and there were 24 kids. The game was a life size cardboard cut out of my daughter in her dress! the crowns were construction paper printed with jewels about A5 size. I taped this game to our front door and painted fake bricks like a castle wall around it. 3.00-3.30 pm: We hired a magician who preformed (also wearing one of my tunics). I made horses out of broomsticks and cardboard heads with a yarn mane. The medieval knight had to rescue his princess while doing certain tasks and riding his steed. First he had to take his long blow up sword and spear a hanging ring, then race on and then throw a ball into a net, pass the palace, grab his princess, and race back to start. His next medieval knight teammate could not go until he was back. It was not so easy spearing the ring and lots of them missed the net and had to redo it. The boys took it very seriously and the girls were cheering loudly. 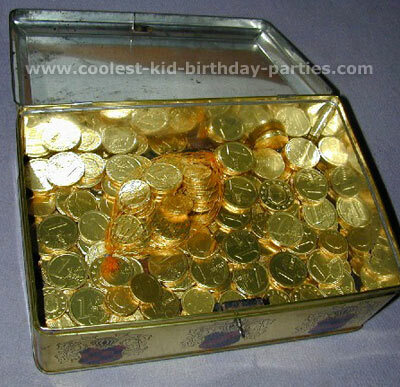 We scattered gold-foiled chocolate coins (with tiny colored stickers) in the garden. The trick was that you had to collect only one of each color. I think there were 6 colors. Anyway they did not know one coin was specially wrapped in silver foil. That one was the team that won. 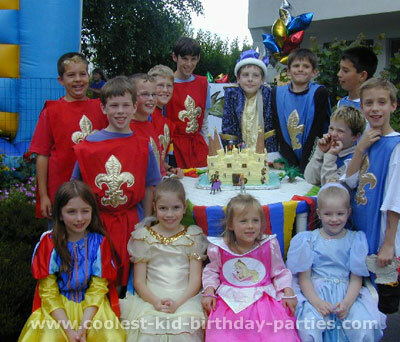 In this case a girl found it and she was the princess for the red team so red won that one. I couldn’t believe my luck when I found this treasure box complete with key at a garage sale. It was for cookies I guess at one time, and could not be more perfect!! I over did the chocolate a bit and there is still some left! We hid a wine glass sprayed gold and they hunted for it. Same as musical chairs but the kids stand up and move in a circle around the pile of swords in the middle. 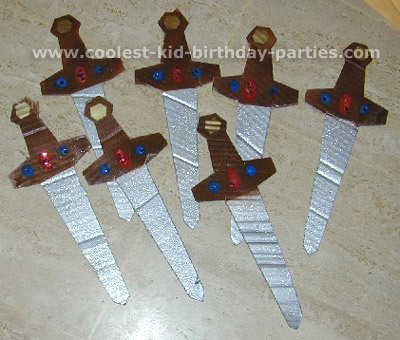 I made the medieval knight swords out of cardboard and sprayed them the correct color and glued on some sequins. This turned out to be the most fun for the boys. 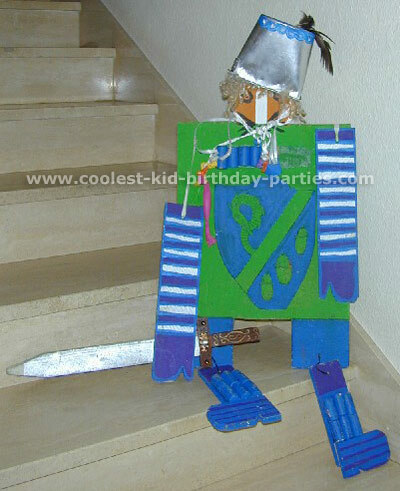 I made wooden medieval knight shields and the matching medieval knight swords fit through the back of the hand with elastic (on the front was pinned a balloon). They had to break the balloon with the sword. For safety, the medieval knight sword could not be moved; you could only hit in one direction (the child was covered by the “body”). If someone got their balloon broken, they had to pass it to the next in their team. (Red and Blue were very serious here!!) I only show one picture here, there are 2; one for each team, but the other is in the garage now. Both sheltered the boy’s body and the wooden medieval knight sword only allowed the angle of the elastic. I wish I had pictures of all dressed up kids, but that is all only on video. Again a red and blue event. 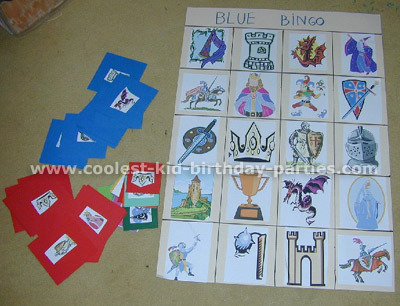 I made GIANT bingo cards one for each team and used clip art of medieval items on it. Each card had the same pictures just arranged in a different order. 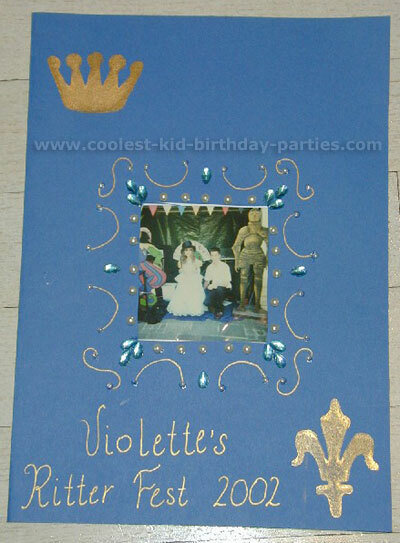 Then I had cards made with the same pictures and drew them out of a “crown” one by one. It was traditional bingo in the sense that you had to fill the card, make a T, or make an O. To make it fair we played first team to get 3 games wins. This is really a short game with only 20 pictures. All our party ware and plates matched. 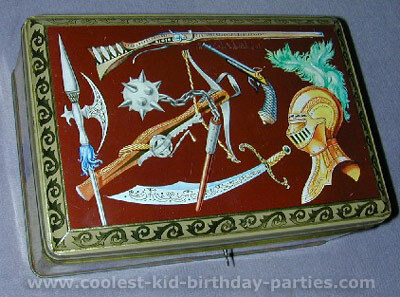 The girl’s boxes were a bit different in the jewels etc. I added bubbles, glitter body paint, and beads. We ate on small children’s tables that had been papered in the correct team color. I had a table set up with a large old-fashioned striped canopy. The local farmer came and roasted a pig on a spit. He set it up in the morning and it cooked all day. We ate at about 4 pm or so (in between the games). Other items served were sausages and chicken served in buns, carrot sticks and crudités, chocolate dipped strawberries, potato chips and cheese cubes. We drank medieval “grog” made of apple juice, sorbet and ginger ale. Since it was hot that day we served lots of water! 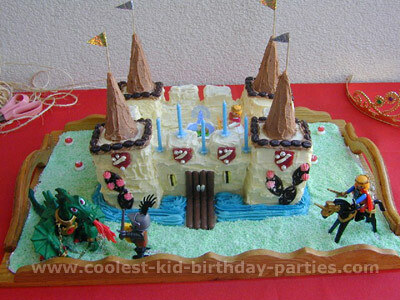 Of course there was the medieval knight cake! And presents. Be sure to notice the princess and the fountain in the middle and the knight saving her from the dragon. My husband knighted all the brave medieval knight “men” and crowned all the girls princesses. Their hats were replaced with plastic tiaras. Then my daughter gave out the awards. I was lucky enough to find real trophies that someone had thrown away at the recycling and I removed all the plaques and used a name maker to put on a sticker that read “Violette’s Ritterfest 2003″. These were given to the winning team (the losing team still got ribbons/medals). Then more bouncing in the castle until the parents took the kids away. But as it was summer and it stays light until 10 pm , I had neighbors and kids in the garden until way past 9 pm. The adults cleaned up and ate leftovers. And as every year my son asks me “So, how was your (insert childs age here) birthday?” Because I know he means, this is really MY party. I just smile and hug him. Here is why it is so easy to have inspiration here. Look at the country in which I live – surrounded by such amazing castles and chateus. 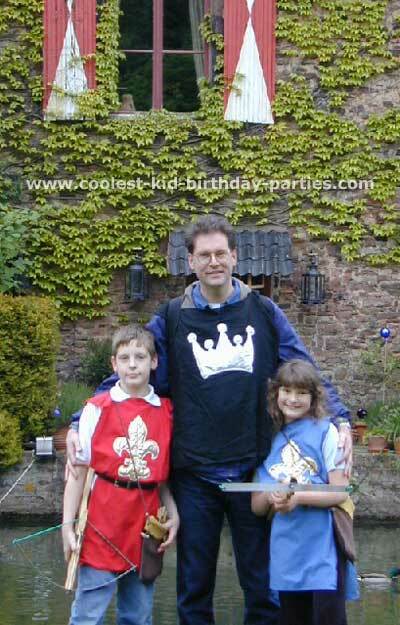 Here is a proud Parent with children and wooden crossbows. Well that is all for today. I still would like to tell you about my favorite ones. We also did a Pirate one and a Mother/Daughter Tea Party. Those were very nice, but the kids said I should write about this one for the contest. Thank you for the opportunity to share it with you. I truly believe that you understand total fascination with birthdays!